Anna Maria felt the deep desire to express herself through music from the time she graduated from acting school. Finally, in 2013, she finally managed to found her jazz quintet, with whom she recorded her first album and went on tour a year later. With the founding of her trio, LOVE&LOST, she continues her singing journey. Actor Anna Maria Sturm originally wanted to make a recording for her acting demo tape. The chemistry with the musicians was a good fit right from the beginning and so less than a year later her album, Tales of Woe, was recorded with the same musical constellation. The record primarily presents songs from the 20s to the 50s from the Great American Songbook, with a core element consisting of songs by "enfant terrible", Serge Gainsbourg. The Israeli pianist Uri Gincel began playing piano at age 15 and soon went on to study at the Alon High School for the Arts. While still in Israel, he composed the music for the award-winning film, Julia Mia, directed by Yuval Granot. In 2009 the pianist moved to Berlin. He has played with Ofer Ganor, Arnie Lawrence, Kurt Rosenwinkel, Bill Summers, Walter Blending and John Bestock, among others. The Danish bassist, Andreas Lang, is one of the most sought-after bassists in Europe. He started playing bass age 16 and studied at the Carl Nielsen Academy of Music in Odense soon after. In 2007 he moved to Berlin. He has worked with numerous musicians in Europe: Anders Mogensen, Hans Ulrik, Kresten Osgood, Mads la Cour, Felix Wahnschaffe, Rudi Mahall, Christian Lillinger, Oliver Steidle, Gunter Hampel and many more. With the band, Hütte, he won the New German Jazz Award 2013. Saxophonist Wanja Slavin began playing clarinet and piano when he was just 6 years old. After initially being taught by his father, at the age of 15 he went on to study saxophone at the Richard Strauss Conservatory in Munich. Later he studied film music at the HFF Potsdam Babelsberg. As a renowned and sought-after soloist in many bands, he has worked with Joachim Kühn, Kenny Wheeler, Médéric Collignon and Peter Evans among others. With his own bands, such as Wanja Slavin Lotus Eaters or Amok Amor, he has been invited to numerous festivals and awarded several prizes. The three young musicians recount a love story with the LOVE&LOST project, including all the highs and lows, moments of happiness and disaffection, unto death. 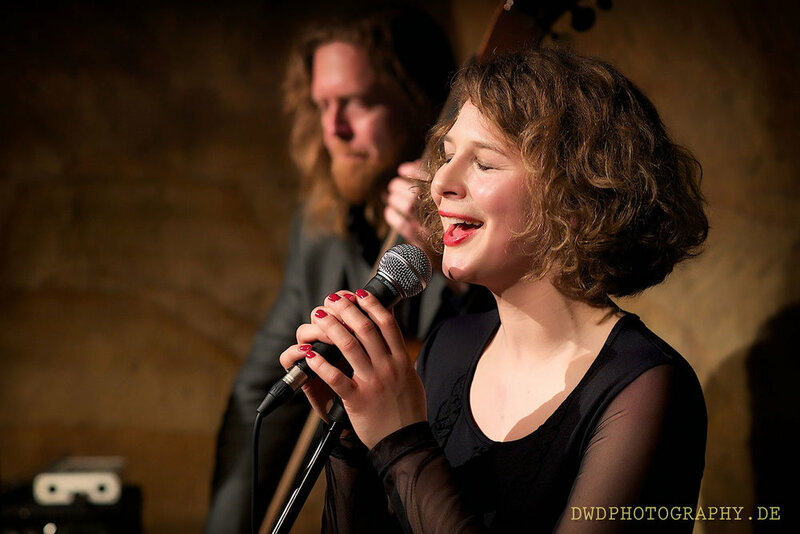 The performance combines songs from Robert Schumann´s cycle 'Frauenliebe und Leben' (A woman’s love and life) with others by the "Queen of Country", Patsy Cline, who died in 1963. Initially, mixing country and classical genres may appear a little contradictory. However, the pain and love inherent in these songs are present in every epoch. The trials and tribulations of love are timeless. Anna Maria Sturm is accompanied by the classically trained cellist, Boram Lie – a permanent member of the soloist ensemble Kaleidoskop Berlin – and the Israeli jazz pianist, Uri Gincel. LOVE&LOST celebrated its world premiere at the Künstlerhaus Schwandorf on February 16, 2017! Austrian writer Thomas Bernhardt (1931-1989) is one of the most important writers of the second half of the 20th century. He is generally known for his novels and short prose plays, while the lyricist Thomas Bernhardt has been all but forgotten. The collection of poems In hora mortis (In the Hour of Death), published in 1958, is one of the poet's earliest works. This collection makes up the second and final volume of poetry he ever published. According to the artist himself, he never wrote poetry again after this volume. Anna Maria recites the entire collection of poems accompanied by Wanja Slavin on saxophone and clarinet. Kharms' texts differ from everything else printed in the 1920s. His estate encompasses most literary genres and is probably difficult to understand without knowledge of his life circumstances: he saw futility and emptiness in mechanised life, ossification resulting from automatism of thinking, feeling and everyday life. His texts are characterised by their brevity and were often subject to Stalinist censorship. The Ukrainian-Russian writer Nikolai Gogol is another master of grotesque prose, and Kharms considered him a great role model. In this reading, Slavin and Sturm attempt to take the listener into the world of these two special writers.